Lost in Infinity 2, mixed medium 23"x28"
One of my favorite things is to come across art work in unexpected places. A few days ago I stopped at the my local library the Morningside Branch on 113th street and broadway, to drop off some books. Since I can never leave the library without taking out a book, I decided to take the stairs up to the second floor and browse around. As I looked up at the sun drenched staircase, I was immediately greeted by the art work of Francine Perlman that was on display on the walls of the staircase. I sometimes forget that this library has made a wonderful use of the walls of it's staircase by designating it as a mini art gallery. They have breathed life into a space that would otherwise go unnoticed, and transformed it into a visually interactive experience. 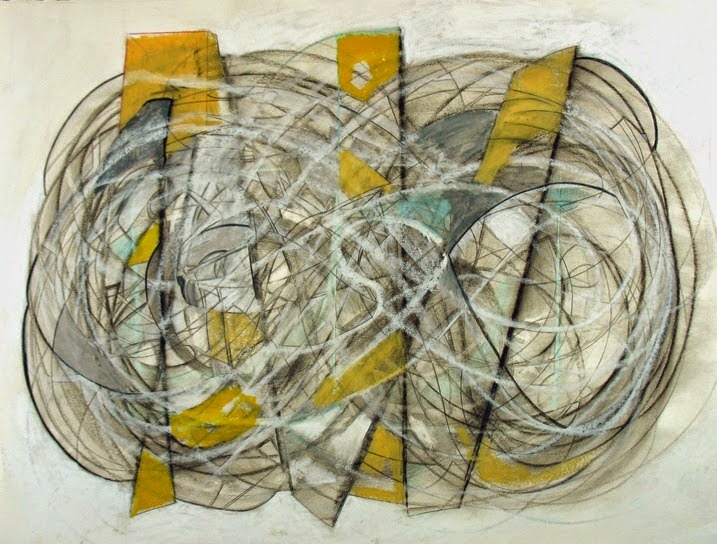 Ms. Perlman's mixed media art work is entrancing as the soft lines in each piece buzz and whirl around each other. I can almost hear the lines and colors play strange and wondrous harmonies within the negative spaces. I am so glad that the visitors to this library, especially the children,encounter art work such as Ms. Perlman's when they go to pick out books. Not all children get to visit museums, much less view examples of abstract art in libraries. I often meet adults who say that their children are not interested in abstract art. I think that exposing children to different types of art early on in their lives, may pave the way for a lifelong interest in it. At minimum, it will secure good memories of art appreciation with their family. Kudos to the staff at the Morningside Branch who are thoughtful enough to keep up this wonderful mini art gallery. They know that early exposure to art is the key to future appreciation of all types of art. Be sure to point out Ms. Perlman's paintings to your children as you pass them along the walls of the staircase. I have a hunch they will be able to create an infinite amount of stories, when getting lost in the infinity of her imagery. The Moringside Branch of the New York Public library is located at 113th street and broadway. Francine Perlman's work will be up until May 31st library hours M-Th 10-7, F-S 10-5.